Although Coriander does like sun, it does not like the heat of summer. It is really a cool season plant and you can grow it from seed, or buy seedlings. Coriander is also known as Cilantro, if planted in autumn as the weather cools, it will be a productive plant right through winter into spring. Be patient, as coriander seeds can take around 3 weeks to sprout or germinate. It does like a sunny position and a well drained soil, it is an excellent plant to grow in a container and will also grow well in the kitchen garden. These are a tall growing plant that will reach 60cm in height. How to germinate Coriander Seed. 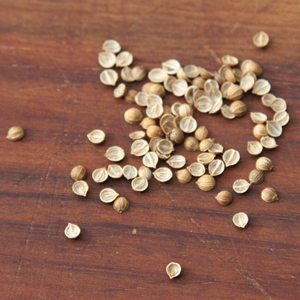 Coriander seeds are enclosed in an outer shell, each one contains two seeds. You can plant the whole outer shell, or break it open and plant the two seeds separately (see image right of split seeds). Germination will be slightly quicker if you split the shell and soak the seeds for 24 hours or so. The seeds do need some warmth to germinate, so this will determine the planting time, and/or method. When to plant – In autumn you can sow the seeds directly to the ground while the soil is still warm. The same in spring as the soil warms up. In winter you will need to start them indoors or in a propagation tray with a heat mat. Prepare the soil well before planting by digging in some well rotted compost and aged cow manure. The surface of the soil needs to fine and loose. The seeds can be planted on the surface and then a little fine sifted compost sifted over the top. Or around 6cm (.2 inches) deep. Water in gently with a liquid seaweed fertiliser. Seedlings should appear in around 14 – 21 days. You can then thin them to around 15 cm apart. If the soil is good, and it rains, you will need to do very little. A monthly application of a liquid seaweed fertiliser and perhaps a fertiliser such as Seamungas, will suffice. You also can use any nitrogen based fertiliser to help promote growth. Make sure you keep the area weed free to avoid competition. Seeds are best planted in trays and germinated in a propagating box. Once they reach a good size they can be translated into their permanent growing position. You may need to sow seeds in a propagating tray with a heat mat to give them some warmth. This simply means they will be covered for a week or so until the seeds germinate. Once the seedlings reach a good size, you can plant them out into a larger container. To ensure a continual supply of coriander, plant new batches of seed every 4 – 6 weeks in different containers or rows. Do not allow plants to much afternoon sun, as dryness and to much heat cause coriander to ‘bolt’ or ‘go to seed’. In summer, grow coriander in a cool shady position to try stopping it from bolting and going to seed. Once plants do go to seed you can collect it, store it in a cool dry place and plant it out as the weather begins to cool. How to Use Coriander or Cilantro. Widely in the Middle East, China and Asian counties where it is an essential ingredient in many traditional and contemporary dishes. Coriander is also said to be rich in nutrients. Coriander can be grown in the home garden and used in a tagine, salads or as an addition to pesto. Both the roots and the leaves are used as essential ingredients in Asian and Indian cuisines. In Asia only fresh coriander is used to create that ‘essential taste’ so if you like asian cooking, grow your own. This is a cut and come again plant, so you can take what you need and let it regrow. The best leaves are the younger ones, we usually harvest from the outside as the leaves grow. Some recipes use coriander root, in this case simply pull the whole plant out. Coriander ‘calypso’ was developed in the UK and is one that has been selected as it is ‘slower to bolt’, it seems to branch from lower than the other varieties and is one that can be treated as ‘cut’ and ‘come again’. It will reach around 30 – 40 cm and is an excellent variety for a container. Its quick and you can usually get 3-4 cuts from it. Around 6 weeks from seed to harvest. Although you can buy coriander seeds in supermarkets and health food stores, these seeds tend to have very poor germination rates. Seeds from a specialist seed supplier have germination rates of around 85%.